Well it’s hump day of our spring break here. 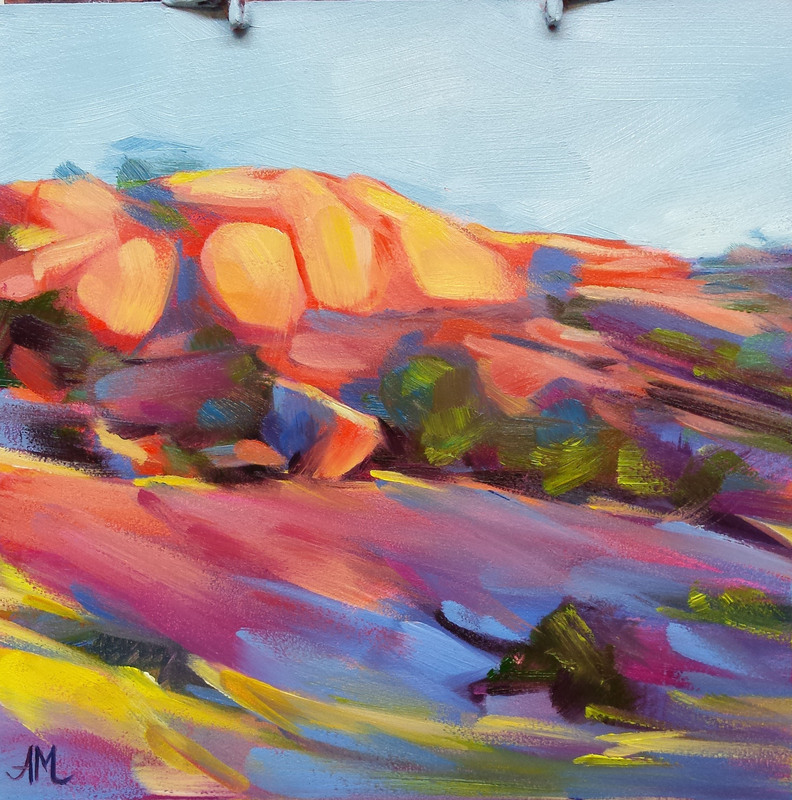 Since my Easy-L tripod is in the shop for repairs I am limited to painting at home this week. So I started looking for fun painting inspiration here at home. 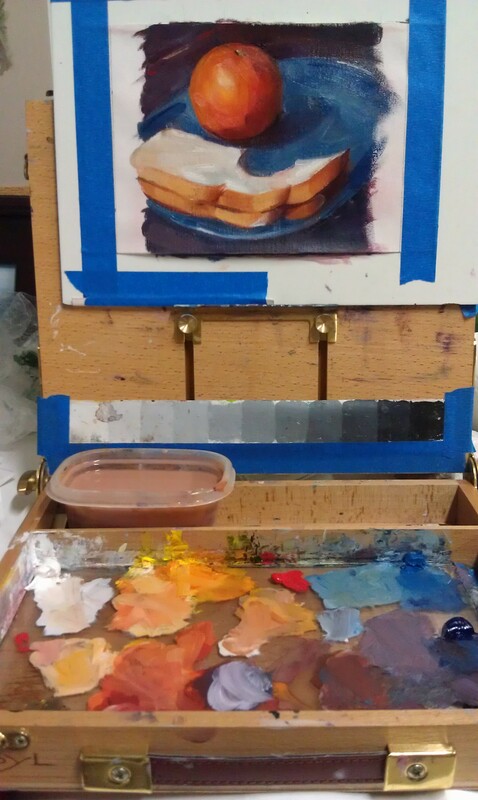 A good day for peanut butter sandwiches and painting! 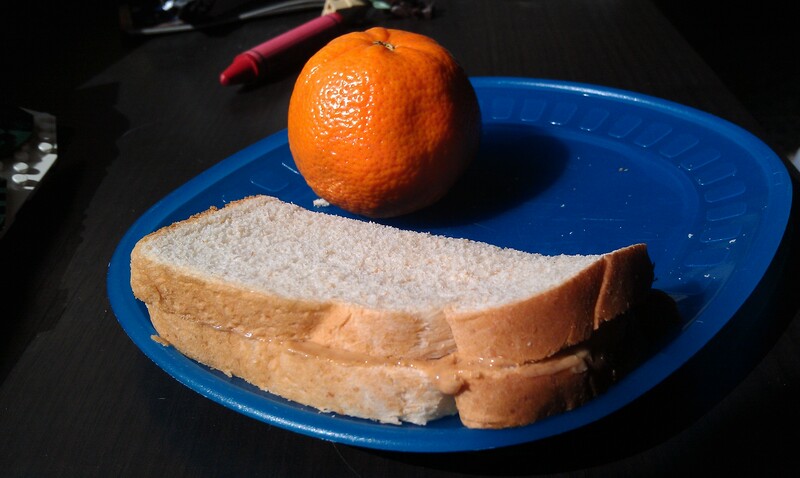 Course lunch time can not be missed, and must be served on the favorite blue plate with rectangle sandwiches. ~for fear of the tummy monster might unexpectedly visit. After scraping my palettes, I laid out fresh clean paint. 2 yellows, 2 blues, 2 reds. Specifically: cad red light and cad red medium and white. 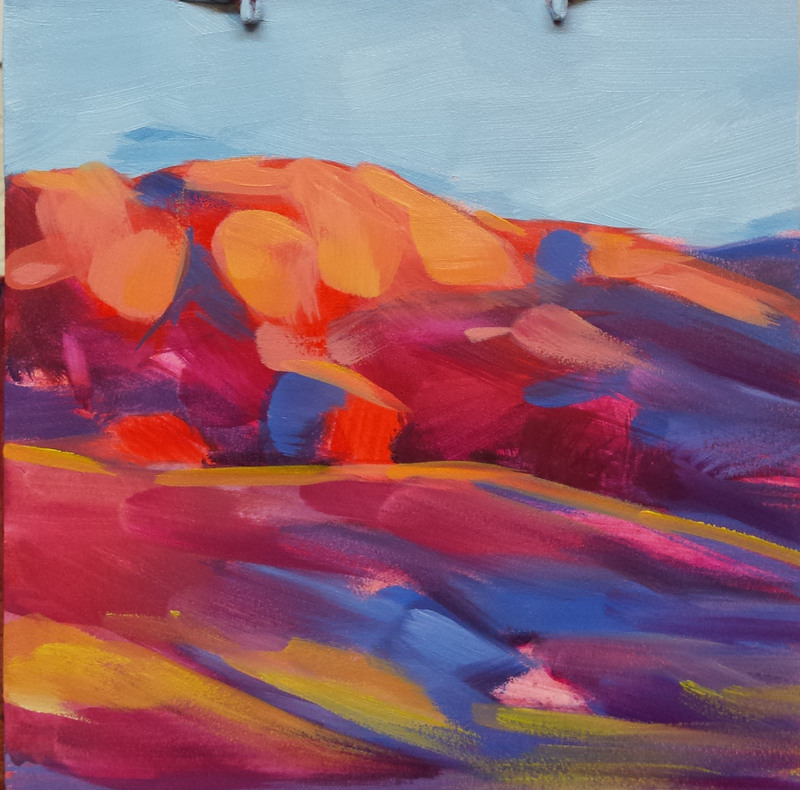 I laid out my under painting with a wash mixture of cad red light and violet (alizarin & ultramarine). Then borrowing a few notes from a recent workshop with Carol Marine I set to painting islands and oceans of clean grays. Turns out it made a great complimentary study. Yes, Blue and Orange or opposites on the color wheel. 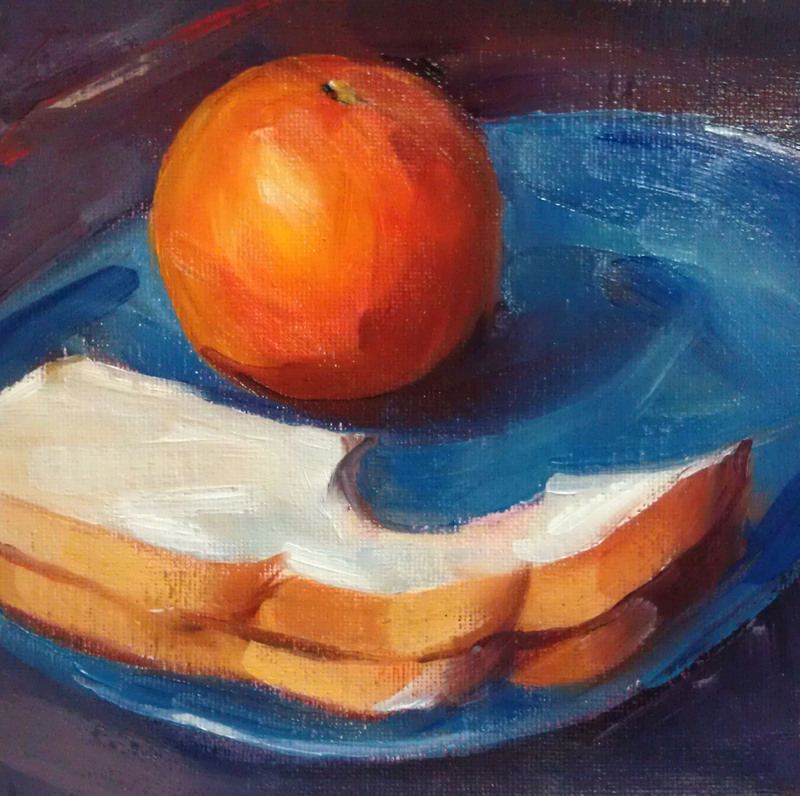 I think I had just as much fun painting the bread and crusts of the sandwich as I did defining the orange. It was a good painting hump-day indeed. Cascarones for Annie! ~more Colorful Fun! Today’s left overs – Cascarones! Well what’s left from our weekend adventures. My backyard is littered with a menagerie of colorful confetti. At least I will have color back there when the sunflowers fade for the summer. But it does make for fun painting. 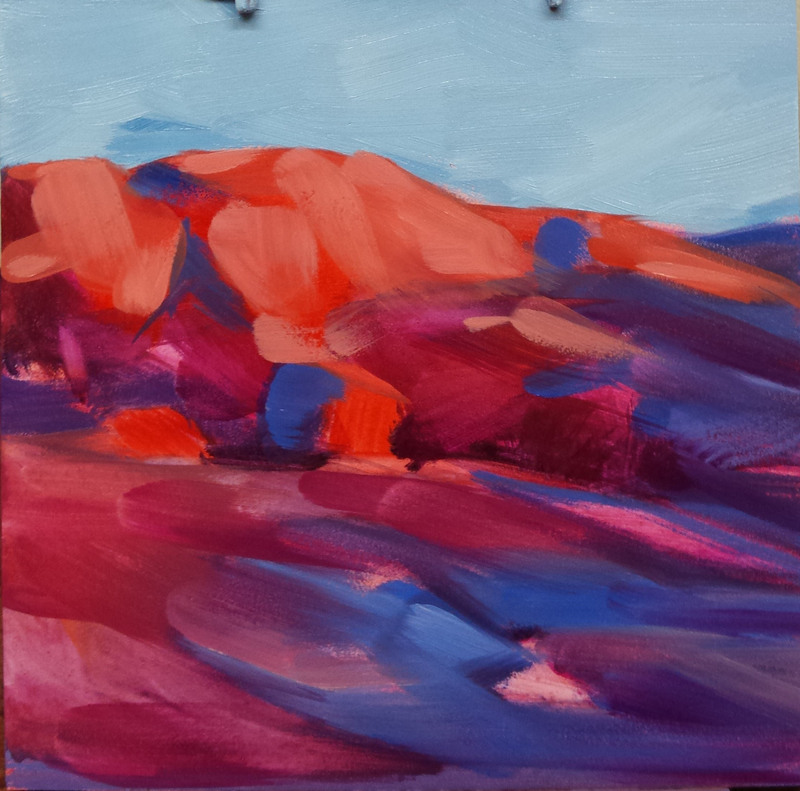 So here is tonight’s play in paint and color. The confetti eggs are very vibrant but the challenge in painting them is figuring out a composition to feature the confetti inside. I intentionally featured the traditional cardboard egg crate too. Good thing I got pictures because I expect the last dozen will be cracked open tomorrow after school. A new year has started and is moving along. It’s already into February of our New Year here with our colder winter spell too. I have been stealing time in my studio as weather temps permit, since my studio is in the garage. It’s currently nearly 50 degrees out there. So it takes a bit of time to get it comfortable to work out there. Paint has a happy temp for optimum working conditions, and below 50 degrees is not it. Between cold spells I plan the next stage of paintings and continue to push on new projects currently underway here in the studio. But that growth requires more supplies. Thus More Paint! I have officially moved onto ordering the super tubes in hopes of making it through the bigger projects. My BIG project for Hamilton Pools is well underway. Notice I have the smaller 18″x36″ painting study above the panels here for comparison. It's going to be this BIG! By BIG, sort of, I mean a 3foot by 6foot painting. And yet, sometimes it’s not quite big enough to relate the magnitude and majesty of a Texas sized treasure. Yet with all large paintings larger quantities of paint are required. 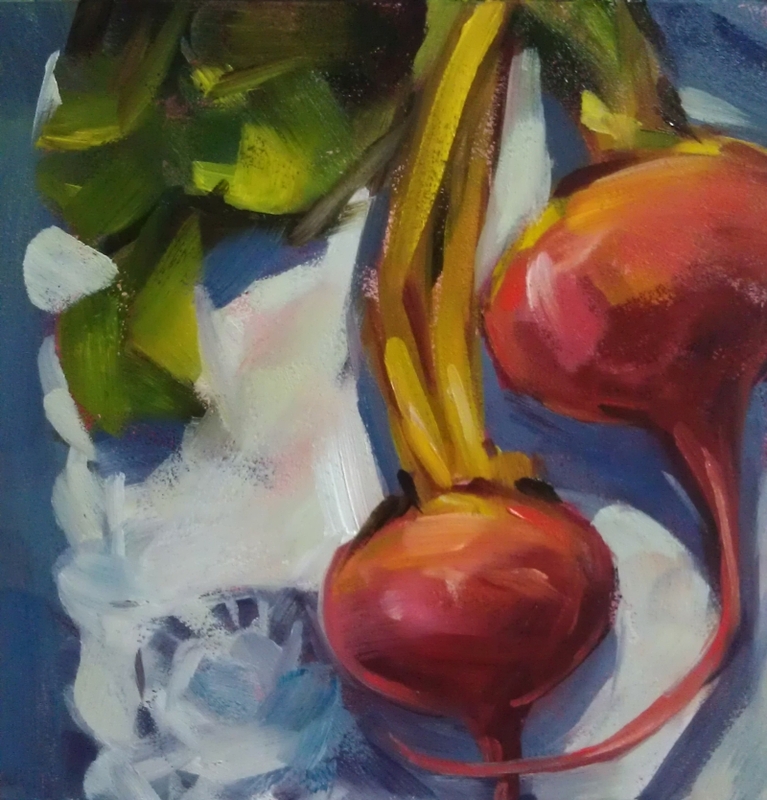 Mixing the calculated colors and values are again a critical part of paint consistency. Matching values changes ensures the ability to relate visual atmosphere and depth of such a large project. Stay tuned to watch the growth of this painting project. Time to catch up, lots to do here. Will post more later.